Your Hollywood party will by red carpet worthy with our Hollywood decorations! Make sure your Hollywood party gets five stars with the help of our Hollywood party supplies. A Hollywood theme party could be perfect for a number of occasions: birthday parties, school dances, or fundraisers. You could even throw a party to watch the latest awards show. No matter what event, we have the red carpet decorations to suit your needs. For a Hollywood birthday party, send out our Awards Night Invitations, and decorate your home with Clapboard Confetti and Gold Star String Lights. For school dances and fundraisers, guests will surely love our Awards Night Photo Props and Miniature Black Top Hats. Your guests will adore your decorations, and youll love the price! Decorate for your next red carpet party without breaking your budget! The first step to planning an Awards Night Party is sending out the invitations. PartyCheap offers the Awards Night Invitations. Each of these invitations offers a place to include name, time, place and rsvp. The next thing you want to do to plan an Awards Night party is figure out which color and what tableware you want to go with. We carry the Hollywood and the Lights, Camera, Action tableware. Cups, plates and napkins are available in these Hollywood themes. You also need to decide what table cover you are going to go with. We carry a large selection of colors and styles of table covers some of these styles include round, rectangular, and a table roll. May we suggest that if you are having an Awards Night party that you go with the black and gold or the Black and Silver Star Metallic Table Skirting to go along with our large selection of Hollywood inspired decorations. Make sure you hand out the award for best male performance with one of our male movie statues. Now that we are finished with the invitations and tables let’s move on to the decorations. You can not have an Awards Night Party without our centerpieces. 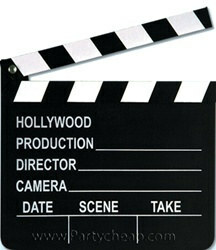 We carry star, Clapboard Centerpiecesthat would look great in the middle of your Awards Night tables. If you would like your centerpiece to be different from the rest we carry black and silver and black and gold top hats that you may attach balloons or a photo. You can not have an Awards Night party with out our Red Carpet Runner. This item is 24 inches wide and 15 feet long. Our red carpet runner is created to give the appearance of a real red carpet. Another item that will look great at your Awards Night Party is our star peel n place. This star looks like the ones on Hollywood Blvd walk of fame. Another item that we carry and would be great at any party would be our awards night star statuette. This item would look great sitting on tables or great for a party favor. PartyCheap has a lot of great items to complete your Awards Night party. Check out all of our Hollywood inspired decorations to complete your Hollywood party. Make sure you pick up some Hollywood theme party favors so that your very special guests will have something to remember your Hollywood theme party with. We suggest the VIP goodie bag and the VIP medallion necklace. Both party favors only cost a couple of bucks but they are sure to be treasured by your guests and they will be thanking you long after the party is over. Show your guests a great time with some of these cheap Hollywood party supplies.